Often we get emails asking for Nile Cruises around christmas. On this website we copied 3 emails as examples with our answers. the Nile Cruises sold in Aswan and Luxor are Last-Minute-Cruises: Boats start to sell the rooms not sold abroad 5 days from departure. Usually it is easy to find very nice rooms on good boats. But you are right: christmas is the highest season ever in Upper Egypt. If you can, I would book now directly. If you like, you can tell me at what day you would like to leave and Waleed will try to find a boat for you. But prices go up, for christmas dinner and changing of the year extras are charged, and there is a big battle between travel agents to get rooms for their guests. Receptionists profit with baksheesh demands to decide whom to give which room. If you can, book now. If I can help you with any other service, please tell me. I will be happy to assist you arrange great days in Egypt. to be honest, if I were you I would book (! =and pay, so it is secure) a cruise now. 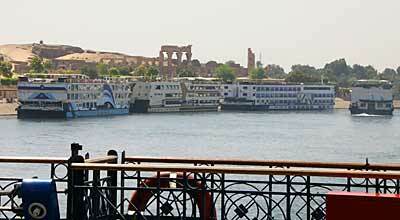 the ones sold in Aswan are Last-minute-Cruises: the rooms which have not been sold abroad. 5 days before departure they start to sell these rooms. In relation to guests asking for them and the number of rooms, prices go up. Receptionists ask for baksheesh to give the room to one or the other. No one knows the prices today, but I can tell you, rooms which usually cost 70 USD can go up to double the price. For Christmas evening there is an extra party: 100 USD more for each person. Do you need more reasons to book now? If you want to take the risk, you can come, Waleed will tell you which rooms are available and for which price. Which boat he would advise you to take and show you the one, or - if you dont like it and if there is - an alternative. thank you for writing. Unfortunately I dont have good news for you. I am working on a website to explain the problems for the time from Dec 20 to the beginning of january, below are two emails which i will use to explain the problems in this time. Usually it is easy to get a Nile Cruise but the changing of the year is the highest season ever in Upper Egypt, prices explode because there is a run for free rooms. You ask for exactly this time. and in case it is not possible take a car or van to travel to Luxor with stops in Komombo and Edfu. These prices include meals, not drinks. You are free to visit the temples in Komombo and Edfu, but you have to go there on your own and pay the tickets yourself. Komombo each ticket: 35 EGP, Edfu 50 EGP each. Komombo Temple is within walking distance from the boat, in Edfu you have to negotiate a horse carriage - try to get one for 50 EPG, maybe pay some more (also carriage drivers know how to use the high season for their benefit. Guide is not included. If you want a guide for you only to travel from Aswan to Komombo, meet you at the boat to visit Komombo Temple, travel to Edfu, wait for you and meet you at the boat to help you with the horse carriage and visit Edfu Temple with you, this would cost 380 EGP (including transportation for the guide). The Nile Cruise ends after check out in Luxor. If you want to visit Komombo, Edfu and Westbanks with a group, you have to book with an internationals tour operator. Meals are included, drinks not. If you want a guide to come to the boat in Komombo to visit the temle with you, then travel (by car) to Edfu, wait for you there, help you get a horse carriage, meet you at the temple to explain: 35 USD incl. transporation of the guide. I sit here on “Emilio” – a 5-star-Nile Cruise boat – somewhere between Edfu and Esna. I must admit, this is my first cruise (not counting felucca tours), and I only booked it to be able to answer emails better. Usually I try to be far away from organized tourism or big restaurants with “international food”. It is Saturday afternoon, I am at the end of the sun deck, the Nile wide and blue in front of me, soft warm wind all day (it is said to be 40 degrees Celsius = hot outside the boat!!!) but I am in the shadow and the wind helps to feel just perfect. I had not thought the Nile Cruise could be so beautiful. I chose Emilio because it leaves Aswan Friday at 11 pm and I can check out Sunday in Luxor after breakfast, in short: I tried to spend as short time as possible on the boat. But today I wish the distance between Aswan and Luxor would be longer, to be able to spend more time here relaxing and enjoy the luxury of a 5-star-boat. It is not boring at all (which I had expected), in contrary: time passes too fast. Waleed reserved on Wednesday and helped me to check in Friday at 11 am. After making sure the room was fine, Waleed left and we had lunch (I preferred the fruits offered as dessert). Because meals are included but drinks not, I signed a bill for 12 EGP when we ordered a big bottle of water, to be paid when we check out. Sitting among all nationalities I already missed Aswan, so we left the boat and returned at 7 pm for dinner. Later we enjoyed the lights from Aswan sitting on upper deck, celebrating our Nile Cruise with two glasses of wine (40 EGP each glass, alcohol is very expensive in Egypt). The boat started to sail, the illuminated skyline became smaller, we passed the bridge and still loved the warm wind after midnight. We arrived in Komombo after midnight, we watched the boat being towed and went to bed. At 7 am I received a wake-up-call, time until 8 to have breakfast, walked from the boat refusing to buy cheap jewelry from Egyptians boys, gave sweets to one, bought the tickets (30 EGP each): 1 hour time for Komombo – the boat will leave at 9.30 am. After making pictures from the tops of pillars (without tourists dancing through the photos), I gave up and decided to take pictures from tourists with colored umbrellas, or posing as ancient Egyptians, and have Komombo ruins in the background. The exit is not the same as the entry. One has to walk to the back and then return along the “Corniche” to return to the boat: it is a good advice not to be late to avoid running. The landscape changes several times after Komombo (picture on top). I had in my mind to work on the laptop in the morning, but I preferred to watch, take photos, wait to see Silsila passing on the left side, wished the boat would stop to sail while we had lunch (the windows in the dining room are higher than the tables), gave our two waiters 10 EGP each as tip (which made them dance, really: dance! and hug us) watched the boat arrive in Edfu from upper deck and were the first to leave it. There were several carriage drivers waiting in front of the boat. In Arabic I asked the first to accept 50 EGP to go to Edfu Temple and back, he hesitated, agreed and when we sat inside the carriage he let the horse run. I felt sorry for the horse in the heat and asked him to let it walk slowly. We arrived at Edfu Temple and I gave him 20 EGP baksheesh “li hossam” - for the horse (my pleasure to pay more than negotiated) and told him he will get the 50 EGP when we will arrive at the boat later. He agreed, told me his name and he would wait at this place. I love Edfu Temple (ticket: 50 EGP each). Of course I have been there before but every time I am overwhelmed again. It is “the most completely preserved Egyptian temple” (Lonely Planet guide book) and I always feel set back in time, see the priests move through the different halls and passages in front of my inner eyes. Can’t stop to take pictures and try to recognize the gods accepting offers. Hamada – the carriage driver was waiting. I asked him to stop at an internet café to check my emails about Aswan Individual. The boat has W-Lan but asks for 40 EGP / 30 minutes which I think is too expensive. Hamada drove us through narrow alleys – probably his neighborhood - and made sure the boy inside the internet café will give him commission. I only downloaded the mails on the laptop and we left after 5 minutes giving 3 EGP. I overheard Hamada will get 1 EGP share. Back at the boat Hamada was not satisfied anymore with the 50 EGP we had negotiated. He asked for 20 EGP more because I was in the internet. I laughed at him and said good bye. Back on the terrace we got tea and cake. I think we were only about 50 persons on the boat so everybody could keep his privacy on the sundeck or had his own table in the dining room. And I started to write this “diary”. It was interesting to watch the boat going through the lock in Esna, at 7.30 pm we had dinner and both waiters (who each had received 10 EGP tip after lunch) were cheerful and told us the tea I had asked for would be “a present from them”. Of course we left 10 EGP each for them again and went on the terrace for 1 hour. When we returned to our room we found two pillows and towels arranged to be an elephant with my friends glasses in the face. Now I sit here and just had to continue the diary and tell you about it. Tonight the crew planned a “Galabayia Party”. I called the reception but there is nobody in the dining room. In the morning we had breakfast (until 9) and checked out. Luxor is so much harder than Aswan, everywhere people run after you to explain stupid things you didn’t ask them for, then ask for baksheesh and complain what you gave would not be enough. A carriage driver offered 20 EGP to drive us around Luxor temple to a cafeteria I know (800 meters?) and after arrival put me into a discussion to pay 50 EGP: it would be 20 EGP for each person (haha) plus 10 EGP for the horse. A taxi driver was fine with 20 EGP at the beginning and didn’t want to let us go until we paid 60 EGP. A police man followed us and asked for money only to leave us alone. I gave 1 EGP and he said this would not be enough he would have a little son at home. A boy asked me to take a picture while we were waiting for the train. First I refused, finally I did it to make him happy seeing his portrait on the digital camera. He brought his mother to see it also. She made a big fuss to pay her 10 EGP baksheesh for it. I cannot tell you how happy and safe I felt to be in Aswan again in the night.